Memorial Day is the holiday that officially kicks off the summer! With the three day weekend packed full of summer activities, it is easy to forget the true meaning of the Memorial Day holiday. More than just a day to celebrate being out of school or off of work, this American holiday is a great day to show our appreciation for those people who have sacrificed their lives for our freedoms. Take an opportunity this Memorial Day to celebrate and remember the reason for the holiday with your family. A great way to honor service men and women is with a patriotic red, white and blue wreath. This wreath is made with the 21" wide decorator mesh and is waterproof. It would hold up well out in the elements. 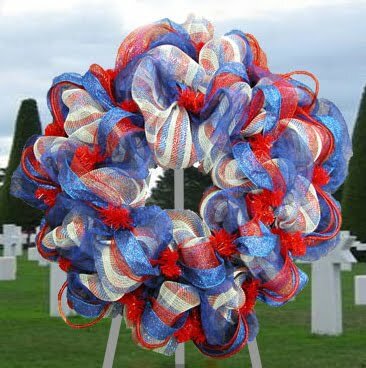 The Memorial Day wreath pictured combines solid 21" wide blue poly mesh and 2.5" red poly mesh ribbon with a red, white and blue striped 21" deco mesh. Making a wreath out of decorator poly mesh is very easy. The decorator mesh is easy to manipulate and very forgiving if you need to re-adjust the shape. For directions on how to make a similar style wreath see the previous post for Mardi Gras Wreath made of Sinamay. You will need about 10 yards total of decorator poly mesh to make this style/size wreath. In the wreath shown the mesh is wrapped around the wreath form twice (once on the inside edge of the wreath form and then again on the outer edge) using the same technique shown in the tutorial. A home-made wreath would be a fun Memorial Day craft project for the family. Create something special with your family this holiday and have a memorable Memorial Day! We now have video tutorials on how to create these deco mesh wreaths. Click here to view the whole list. Decorator mesh is also great for bows, gift wrap, garland and so much more! you showed the memorial deco wreath and it beautiful. It would have been great to see how it was made. How you intertwined all the deco mesh colors. Hi there, thanks for posting a great question. Simply follow the steps our designer shows with your deco mesh color of choice, and instead of using the cosmic twist, use a ribbon or a lame`, and then layer on top of that some deco flex tubing ribbon. If you would like a list of products to make the above wreath, please email me at jessie@mardigrasoutlet.com.